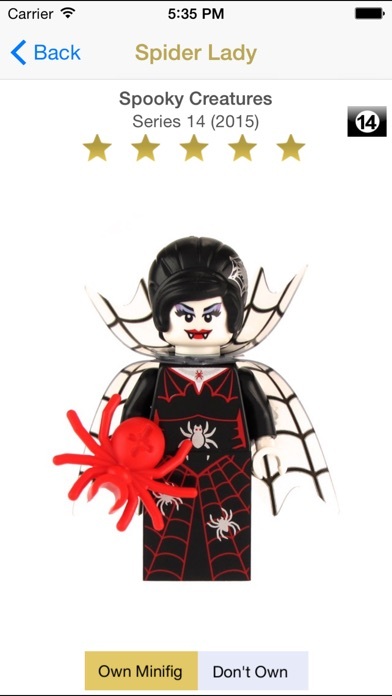 MyMinis was last updated for Series 14 with 16 awesome minifigures! Use the Photo Touch Guide to find what figure is hidden in the bag by touch, the best way to find them all! 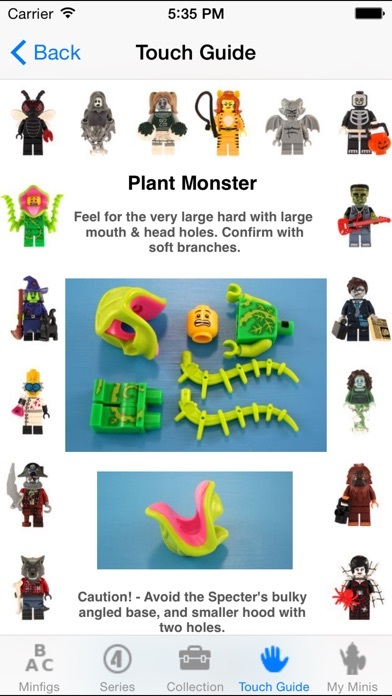 See the Plant Monster, Spider Lady, Galaxy Trooper, Hod Dog Man, Snake Charmer, Wizard, Fairytale Princess, Swashbuckler, Piggy Guy, Gingerbread Man, Ice Skater, Island Warrior, Bumblebee Girl, Fairy, Skier, Roman Commander, Leprechaun, Genie, Gladiator, Cheerleader, Soccer Player, and more! 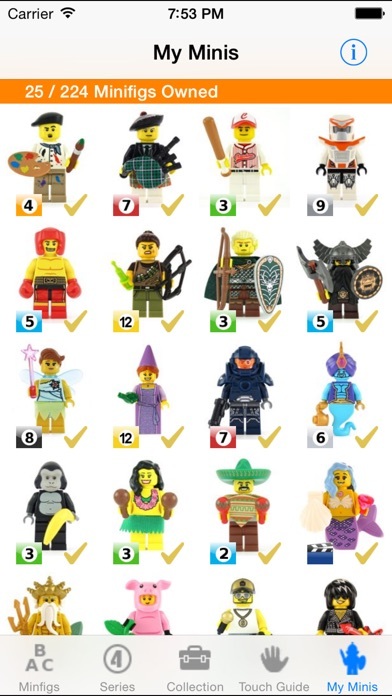 All 272 LEGO® collectible minifigures are here from Series 1-14 (including the 3 special themed additional series). You can see your own collection, or browse by name, series, rating, or theme (music and dance, or exploration and discovery for instance). Manage your collection, and use the Touch Guide at your nearest store and complete your collection today! APPLE AWARDS: - A New and Noteworthy App in 12 Countries! - A Hot App! USER REVIEWS: - Really really cool and fund to use! (Gealmo) - Superb! A must for any collector/adult child! really love the touch guide :) (Windymiller73) - Best thing I ever bought...that is until I get the actual minifigs... (DutchCoco) - This app helps me to find the correct minifigure. (Jianed) ****COLLECTOR FEATURES**** - Easy to mark off what you own - Rate your favorites - Grouped into fun themes like Music and Dance, or Team Sports - Beautiful large retina photos of all figures to look through - See your own collection on one screen - Super easy and fun - like holding the figs in your hand! ****PHOTO TOUCH GUIDE**** - Multiple photos of unique pieces - see how they feel from different sides. - Instructions and photos of what to feel for, and photos of similar parts to avoid. - Find the fig, avoid duplicates, save money! Retina display is used for fourth generation devices and higher. No Internet connection is needed - all content is local on the device so you can take your collection with you wherever you go! The collectable minifigs are the secret figures found in the small green, blue, black, and gold bags found usually at the end of an aisle or at the register, or of course in a LEGO® store! You can't see what's in the bag until you open it. Warning - You will want to get them all after seeing how awesome they are! ----------- Legal information: MyMinis is a registered trademark of Cherry Hill Technology, LLC. 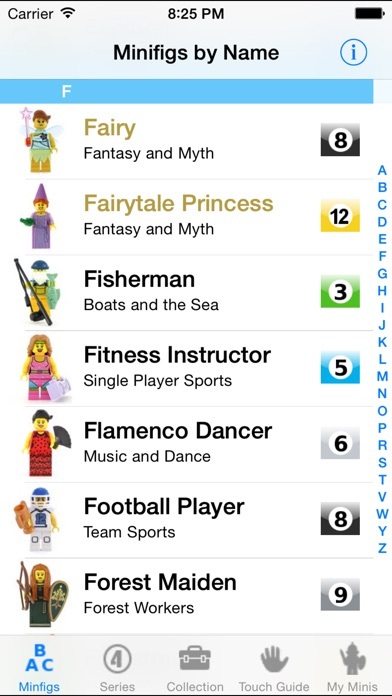 LEGO® and the LEGO® Minifigure figurine are registered trademarks of the LEGO Group of companies which does not sponsor, authorize or endorse this app. The creator, Cherry Hill Technology, LLC, is not in the business of selling, buying or trading the LEGO® Minifigure figurines. The app is a resource for collectors. For legal questions please contact us directly at ideas@cherryhilltech.com. Mehr ist nicht zu sagen!!! ...dafür einen Stern Abzug. Ansonsten bin ich sehr zufrieden. Besonders die Anleitung zum Ertasten ist gut gemacht und erspart Doppelkäufe. Wenn die Updates noch gleichzeitig mit den neuen Figuren kämen, gäbe es 5 Sterne. Gute App aber die Updates auf neue Serien dauern zu lange. Neue Serie noch gar nicht dabei. Hatte mir mehr von versprochen, als nur die Sonderserien. Schön wäre eine Übersicht der diversen Serien: City, Ninjago, etc. Für einen Sammler ist die App super. Ich kann auch swminis empfehlen - für Star Wars Legofiguren.